How To Customize Battery Saver Mode In Android Oreo? Nowadays, smartphones have become the most essential and primary source of communication. They have taken over personal computers and other similar communication gadgets and has remained as the first choice of telecommunications in many segments. Notably, there are is one aspect of Smartphone that makes it little hard to access for long hours and that is its limited Battery longevity. This tutorial will solve android oreo battery drain. This is something which is beyond the control of any general non-tech savvy people, although there is an option where you can increase android oreo battery life but up to a certain extent and time. An operating system, such as iOS(Apple), have a closed system, which means any developer or engineer outside its organization cannot change the coding for its personal use. Unlike Apple, Android is an open-source operating system and gives access to developers for altering the Battery saver mode according to their need. Here are some tips for android oreo battery improvement and android oreo battery optimization. 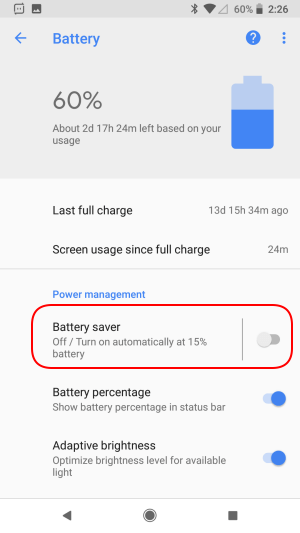 Battery saver mode on Android is known to be quite useful at extending your battery life by eradicating background application processes, closing down unwanted graphics and various other operations. If you’re on a low battery, turn this feature on and your smartphone will get a longer breathing period than usual. You can ease your day out by managing important calls without draining your battery too much. However, it has some flaws as well. It seems some features are excessive or unnecessary. For instance, battery saver mode may put your phone under vibration but that again will draw more power. On the other hand, by disabling the vibration mode, there is a significant chance that you may miss important calls or messages. The screen gets dim during battery saver. These are some issues which users had to face while using battery saver, with not being able to do what they want. However, we have brought something fresh and new for you to learn in this regard. In the below segment, you will know how to customize battery saver mode in Android 8.0 Oreo. To follow these steps, the only thing you need is Adb. Just go through the steps shown below and you can customize your battery saver mode in Android Oreo for maximum power delivery. The exciting part of Android Oreo is that it has left an area of improvement to edit the battery saver processing. That’s the reason; it is getting immense popularity amongst the mass. 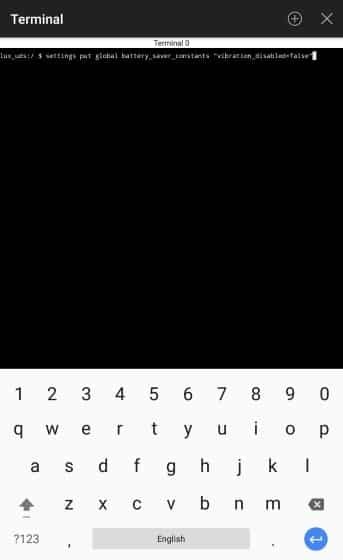 There are specific commands for customizing the battery saver mode in Android Oreo which require adb, and the appropriate changes you make will help you get it over. Firstly, observe the following line, which is a part of the source code of Android Oreo. To simplify the above statements, each of these values has a Boolean, an integer, or a float value. A Boolean is a quote named only “true” or “false” an integer is just a whole number, and a float is a number which also can be in decimals. To allow animations in battery saver, we want to set “soundtrigger_disabled” to “false”. To disable the brightness dim, change “adjust_brightness_disabled” to “true”. Now as we have understood the basics, it’s time to learn on how to manipulate the existing battery saver setting. 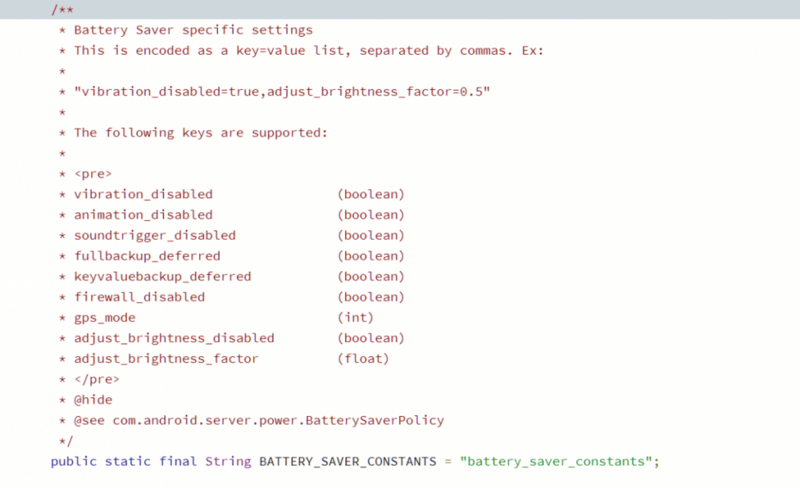 After selecting the values that you want to change, you can set up the ADB commands that you want to run to perform these changes to your customized battery saver mode. Just for say, you can enable vibration and disable the sound trigger option while turning on battery saver. Now, it can be fully customized at your desire. First, open up the command tab and type “adb devices” to provide accessibility of your device by your PC. The moment you get something like the output above, type “adb shell” and you are good to go. To get the solution for the above-mentioned situation, a specific line needs to be written as follows. As mentioned above, we have given the appropriate change to the algorithm to make the battery saving mode into a key=value separate list. It is up to you to add or remove any operands to this above command with n-number of permutations and combinations possible. Note: The values that you have left untouched will not get altered and will automatically denote their original, default values. Not to forget-after typing the above command; completely delink your phone from the computer. Now, enable battery saver and check out, as you will find that your mobile now vibrates, with sound triggers getting disabled. It can also be done by editing these settings from your device itself if you have root! If your device is rooted by MagisK and Super SU or you can just run the same command as above from a terminal app such as Termux. Note: While performing execution the commands through your phone, do make sure to erase “adb shell” from the mentioned commands. Google’s Android Oreo has shaped up as one of the most developer-friendly Android versions amongst its ancestors. Providing such a wide range of features for the community by making their development for their use, no doubt the customization facility for Android Oreo is very open as compared to others. Not many Operating systems give us the ability to customize the Battery Saver mode. This system altering access comes as a boom for those, who don’t like to get disappointed although being on low battery. Fundamentally, an open source operating system like Android is a perfect platform for those developers and engineers, who wish to see a change in programming world for upcoming future. thus you did Customize Battery Saver Mode in Android Oreo.